This issue we've talked to David Moorhouse, a photographer who I noticed when he showed some amazing pictures of Glencoe on Flickr which you'll see included. I was born in Huddersfield Yorkshire, typically of the West Riding, my mother worked in a woollen mill & my father was involved in Industrial Engineering. My father was a farmer’s son & I think he missed the rural life, consequently they became avid campers & every weekend between March & October our family would set off for various parts of the Yorkshire Dales. I suppose those former years brought me into close contact with the countryside & my main interest was to catch trout from various rivers in the Dales. I used to be up at 4am in the morning, have an hours fishing on rivers where I wasn’t supposed to fish & be back in my tent for 6, this kept me out of trouble with the bailiffs. I think my parents turned a blind eye to this practice, they enjoyed the trout. When I wasn’t fishing I could be found on old lead mine spoil heaps turning over rocks looking for interesting specimens of mineral. I had an intense interest in geology & fossils which has remained with me. I am a curious person by nature & will go out of my way to investigate something which might prove interesting, (sometimes to my detriment). I have a multitude of bits & pieces I’ve picked up from various parts of the world on my window sill, it’s junk to most people but I enjoy remembering where they came from. At school, I enjoyed sport and art, my drawing skills were good & I had an encouraging teacher. Leaving school at 16 I was employed by a local builder & continued education on a part time basis to qualify as a Quantity Surveyor. I changed my industry after a few years into Civil Engineering which I found much more to my liking. Motorways, dams, nuclear power stations, & the water industry provided me with interesting challenges, mainly in the North of England & in my later years my interest in computing led me to develop & instigate Project Management software for the water industry. I ended up commuting up & down the M6 on a daily basis as a consultant & after 10 years & realising that the M6 was becoming a bigger car park between 6:30 & 8am in the morning, I decided to hang up my boots & retire. I was fortunate to have married Linda, whom I met whilst camping, she also likes being outdoors & we both enjoy a good walk up a Lakeland Fell, she has a good eye for an image & very often points things out that I’ve not seen. She doesn’t mind me stopping to set up a tripod on frequent occasions & carries a book to read! Vocationally, my interest in art combined with the outdoor pursuits led me to take up landscape watercolour painting. The Lakeland Fells were right on my doorstep & I think it was these activities that eventually caught my interest in photography. I found it useful to record ‘the landscape ’or parts of it on film that I could use for my paintings. My other main interest is fly fishing which became a fanatical hobby, I’ve been lucky enough to travel to some remote areas of the Northern Hemisphere to pursue salmon. I’ve spent time under the midnight sun & been in rivers with salmon so numerous that they were swimming between my legs. I’ve been a little too close to nature at times & an encounter with a bear who joined me in the river left me with an unforgettable but pleasant memory, but it was not so pleasant at the time. You obviously enjoy fishing a great deal, does a camera come out with you on those trips and do you ever produce work you're happy to show (if so can we have a look!) Text to go with audio Visual? I fish as a member of Lancaster Anglers for salmon on my local river, the ‘Lune’. A fewyears ago I used to carry a compact camera (until I dunked it too many times) to record some of the characters I fish with & to record the different moods & conditions in the valley. I was asked to do a presentation at an AGM a few years ago & put together an audio visual for them. Members have become very conservation minded in recent years & we return most of what we catch even though we are only permitted to retain 4 fish per season. The club finances & runs a salmon hatchery in the higher reaches of the river. We undertake the trapping of salmon in the breeding season & strip upwards of 100,000 eggs per annum which are brought on as juveniles (smolts) before placing in the small streams & tributaries of the Lune. Sent link via e-mail of audio/visual if you’re interested. I may be able to produce a mpeg version? What are your most proud of in your photography? My daughter has asked me for a print to put on her wall, she never asked for a painting, so I’m pretty pleased with that. In most photographers lives there are ‘epiphanic’ moments where things become clear, or new directions are formed. What were your two main moments and how did they change your photography? My ‘epiphanic ‘ moment if you can call it one occurred relatively recently when I retired. To give a little background to this, I had been brought up with film, Fuji Velvia & Provia. When digital SLR’s first came along I couldn’t afford one, they were new technology & extremely expensive. My first venture into anything digital came with a visit to the FOCUS show at Birmingham where I purchased a Nikon film scanner which enabled me to get my transparencies onto my computer. The process was horrendously slow but once scanned I could start to get to grips with the vagaries of Photoshop and I could turn out a half decent digital image. The price of digital started to drop & I purchased a first generation Nikon D40, it was a disappointment, terrible colour casts, & what I felt was poor quality when compared to my Fuji transparencies. The guys at the local camera club were very disparaging about anything digital, ‘it will never replace film’ they said & I think I was the only member who was interested. The club could only project images through a slide projector & weren’t interested in trying a digital projector so I drifted away from the club & my interest in photography took a bit of a dive. To come back to my retirement, I wanted to pick up where I left off, & so I purchased a second hand Nikon D300. My epiphanic moment was when I found that digital gear had come on in leaps & bound since I left it. I felt I now had something that I could work with & since then have been immersed. The advent of camera RAW was the second most epiphanic moment , finding that I could now control any exposure to a fine degree. What a revelation that has been to my photography. Tell me about why you love landscape photography ? A little background on what first passions were, what you studied & what job you ended up doing. Landscape photography brings together all the aspects of being outdoors which I enjoy so much. I find beauty in all aspects of nature, its forms, colours, moods, it’s geological history, the wildlife, & the weather. I do enjoy extremes of weather, John Ruskin observed, ‘ there’s no such thing as bad weather, only different kinds of good weather’. I really can concur with that. But just being out there is a good enough explanation, it’s probably a spiritual thing? I’ve also found that landscape photography has taken me into environments which I might not have experienced otherwise. Recent trips to Scandinavia & Iceland were memorable experiences in Winter to capture the Aurora, being out in petrifyingly cold conditions until 3am was exhilarating & the aurora uplifting. I also managed to get some memorable images. Could you tell us a little about the cameras & lenses you typically take on a trip & how they affect your photography. My cameras have always been Nikon. Mmy investment in lenses from my film camera days made it so, whilst I was nearly tempted down the Canon route I’ve stuck with what I know best & I’m very comfortable with that. My current gear is a Nikon D800 which I’m finding quite an interesting challenge it has certainly slowed down my technique & can’t be a bad thing. I’m very pleased with the results. I’ve found that my hand held shots are not up to scratch, they tend to be a bit soft , consequently I carry my tripod on all my trips out. I have a carbon tripod & lightweight arca swiss head with quick release. I also have fitted a Kirk L bracket to my camera body so I don’t need to move position when going from landscape to portrait. Lens wise my mainstay are 17-35, 24-70, both f2.8, the only drawback for these lens is weight, I’m not sure my choice of going to f2.8 was the right one for landscape, I rarely take shots at f2.,8 but 17-35 is handy fully open for night work. I purchased 14 -24mm in February for my trip to Iceland where I wanted to photograph the night sky & the aurora, I was very pleased with the results. artful images. For trips out purely for photography I put everything into a Lowepro Vertex back pack, it has a tripod carrier but I find it more comfortable to carry my tripod in hand. I do find the Lowepro pack heavy & not that comfortable, why do DSLR’s have to be so heavy? If I’m out on the fells, I will take my walking rucksack & pack the 24–70 & D800, whilst not ideal, it’s much more comfortable & I can take food & waterproofs in side & top pockets. I must say that I’ve yet to come across a camera bag that is ideally designed for comfort & can carry a DSLR, a couple of lenses, waterproof clothing, food and a flask. If I want to get a bit wider with the 24-70 I do turn it into portrait mode & take a number of overlapping shots to produce a panorama & blend them in Photoshop, I just have to be a bit careful with parallax. One item I pack is a full sheep skin chamois which wraps around my camera in rain, I picked this tip up from Doug Chinnery’s blog, it works well, keeps everything dry & useful for wiping rain drops off the lens. The D800 made me re-think my computer requirements since the files it produces are very large. My desktop PC was in need of updating so the D800 was a good excuse to build a new one & I’m now reasonably up to date. I crammed in as much RAM as possible & I am using a solid state drive for launching programs & a further one as my Adobe cache drive, this has speeded things up considerably. I’ve also upgraded the hard drives & use a number of 2 terabyte drives for storage & backups. You've done some fabulous snowy walks in Scotland - how much training do you think photographers would need to follow in your footsteps? I don’t do any special fitness training but I’m used to walking in the mountains & have had some experience in winter conditions. I wouldn’t recommend it to anyone who was not used to strenuous uphill walking. Scotland is much more severe than the Lake District but the Lakeland or Welsh mountains are great to start with as long as you abide by the usual safety advice & check local conditions. These can be found on various websites that update daily. I wear layers of clothing, with a waterproof jacket & hat & dark glasses in snowy conditions. A pair of strong boots with good soles are essential, I take instep crampons (the walking not climbing variety) which give a good grip on ice. Paths tend to attract water & they soon get rimed over with ice. A couple of walking poles are handy for support especially descents. I always carry my walking GPS & spare batteries with a backup map & compass. I also carry a headtorch with spare batteries & an emergency bag & whistle. I keep camera batteries in my inside trouser pockets they don’t last long if you let them get very cold. A bit of Kendal mintcake & chocolate for energy & a flask of hot coffee is a welcome snack in cold conditions. We were in Glen Coe in February. My wife, some friends were out climbing in Glen Coe. We saw them off in the morning whilst we went off down Glen Etive to look for some photographic opportunities. They were due back with us at 5pm for dinner, with an understanding that if they weren’t back by 7pm then we should start to worry. They are both experienced climbers & were fully kitted out & used to descents in the dark. At 6:30pm I went out to look for them. Their’s was the only car left in the car park, it was pitch black & I could see no sign of them on the mountainside. In this image taken at 7:45pm you can just make out a faint light high on the mountain, this was their descent route, they reached me at 10pm what a relief, they were well overdue. They were perfectly OK & knew that they would get down safely. But they underestimated the difficult descent & were worried that I may have called the emergency services, more especially when a rescue helicopter overflew the car park at 9:00pm. Earlier the same day when returning from Glen Etive I took this photograph of the Glen Coe mountain rescue descending from the climbing accident when 4 unfortunate climbers lost their lives in an adjacent valley. At the time I thought it was just an exercise. What sort of processing do you undertake on your pictures? Give me an idea of your workflow..
other tools not available in Lightroom. I do have a few plug ins. I use ‘Tony Kypers’ actions for luminosity masking which I find excellent , www.goodlight.us & Nik Silver Effex Pro for my mono images. Conditions were very cold, icy & with plenty of snow up the valley although there was no snow in Glen Coe where we were staying. There’s an old drovers road which winds its way down from the junction of the West Highland Way & the Military Road from Altnafeadh into the Glen Coe valley. Conditions in the mountains were bad despite the sunny weather, there was a strong wind with severe wind chill so we chose to take a walk along the old road & see if I could get in a couple of photographs of the spectacular landscape. The Glen Coe conditions image was taken with a 80-200mm f2.8 lens from the hillside above the drovers road. You can see the wind driving the snow up the slopes of the mountain. This was fresh snow on top of ice & old snow, dangerous avalanche conditions. The crown of Buachaile Etive was taken from a spot further up the valley on the opposite hillside again with a 200mm lens. It was a superb sight, I’ve never seen the top like this before every nook & cranny was covered in ice, I think the high winds had blown most of the snow off the surface giving an intimate & detailed view of all its nooks & crannies. I was fortunate to get a shot in, clouds rolled in soon afterwards to hide the summit. I was hoping to take some night shots in Glen Coe but other than the night of arrival, the night skies were cloudy for the rest of the week. A test shot was all I managed. There’s loads of potential, it just means that I will have to go again. I haven’t printed many of my images, a couple for the wall at home & that’s about all, these were outsourced. I would like to print a few more in a very large format, I’ve always fancied being able to step into a picture but I’m still pondering on that. I was hoping to visit the Joe Cornish’s exhibitions over in Northallerton to see if I could pick up some ideas. Tell me about the photographers that inspire you most. What books stimulated your interest in photography & who drove you forward, directly or indirectly, as you developed? Book wise, I bought a set of John Shaw’s publications back in my days of transparencies. They were ‘Landscape Photography’, ‘Close ups in Nature’ & Focus on Nature’. They were no nonsense explanations of how to compose & take photographs using a film camera, a lot of which still holds true today, that together with Charlie Waites ‘The making of Landscape Photographs, provided me with initial inspiration for my photography. I still pick them up from time to time. I also have some David Ward & Joe Cornish publications & I have recently purchased a ’Vincent Versace’ book ‘From Oz to Kansas’ which concerns black & white conversion techniques. It’s very technical & detailed but I’m finding it quite refreshing . I do enjoy black & white images. In terms of inspiration, I have to look no further than the web, there is so much material out there , it’s like having your own personal library at your fingertips & you can dive in whenever you feel the desire. I do enjoy David Ward’s and, Russ Barne’s images & the Jim Brandenburg’s website whilst being very commercial has some beautiful images in his galleries. I don’t subscribe to any monthly magazines. 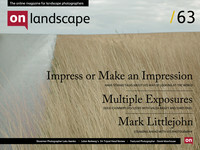 On Landscape does a fine job & I get inspired by the articles & photographers which appear in it on a regular basis. Tell me what your favourite two or three photographs are & a little bit about them. Out for a walk above Derwent Water with Linda, we passed through this wood on our way up the fell side in bright sunshine, on the way back the bright sunshine had given way to clouds & the lighting was much better for an image. As we passed through the wood this view into the wood was a pure chance encounter, it seemed full of colour & tones, sometimes you get an unconscious feel about a scene, I’m not sure what it is & I struggle to express myself most of the time. Anyway when I downloaded the file I was pleased with the result, it’s so typical of the Autumn woodland in the Lakes, this is one image I’d like to print large for a plain wall & imagine myself walking into it. Iceland is currently a popular destination for photographers & if you’ve been you can understand why. I’ve been wanting to visit Iceland since I was a young boy, initially to experience the geology & the volcanic activity. It certainly did not disappoint, I am keen to revisit and explore the places off the tourist trail. This image was taken overlooking a glacial lagoon in very low temperatures with the aurora appearing from time to time. As I jumped from foot to foot at 2am trying to keep warm the large piece of ice shaped like a saddle drifted into the frame, at the same time the aurora was displaying behind the range of mountains in the distance. I was set up wide open at 14mm with an ISO of 2000 & exposed for 20 seconds, this was the result. I was particularly lucky with the night sky , the few clouds & stars were perfectly placed. I am always astounded by the number of stars that show up on a long exposures, the bright object in centre is Jupiter with the star cluster of Pleiades just to the right. The Langdale Barn was again taken on a snowy day in the Langdale Valley of the English Lakeland. The snow has obliterated the background mountains in a white mist. Tthe position & shapes of the trees seemed to be in sympathy & protecting the barn. The conditions were perfect to make the strong shape of the gable stand out. Minimal processing was done in Silver Effex Pro. That’s easy, if conditions were right, I’d be out on the river casting a fly, or out for a good walk with Linda. If it was wet I might be tying up a few new flies. Being a big fan of the Lake District, what would be your favourite off the beaten track location that combines a nice walk with some good photography? What sort of things do you think might challenge you in the future or do you have any photographs or styles that you want to investigate? Where do you see your photography going in terms of subject & style. This is quite a difficult question to answer. I’m always challenged by identifying the composition in my photography, I’m not sure if it’s anything that can be taught but comes with intuition & experience, the latter being the one which at least I can work on. My camera has many bells & whistles most of which I don’t use, I have all settings in manual mode & probably bracketing exposures is the thing I utilise most of all. There is a multiple exposure mode in the menu which I would like to explore, I’ve seen a few interesting images using this technique so it’s one I’d like to experiment with. I’ve bought a 24 mm tilt shift lens, this is proving to be a big challenge, getting the focus sorted being the worst. The D800 ‘live view’ is not the best so I think I need to spend more time with it to get the results I’d like. Blending multiple focus images is another technique to try on my list. I am hoping that further experience will help me achieve more artistic interpretations of the landscape, I’m conscious that I need much more practise yet, it’s a continuous learning process & in that respect it’s probably out at the infinity mark somewhere. Have you any tips you would like to pass on to Photographers? Always make sure your camera backpack zips are closed before throwing it over your shoulder! You can see more of David Moorhouse's work on his Flickr Stream.